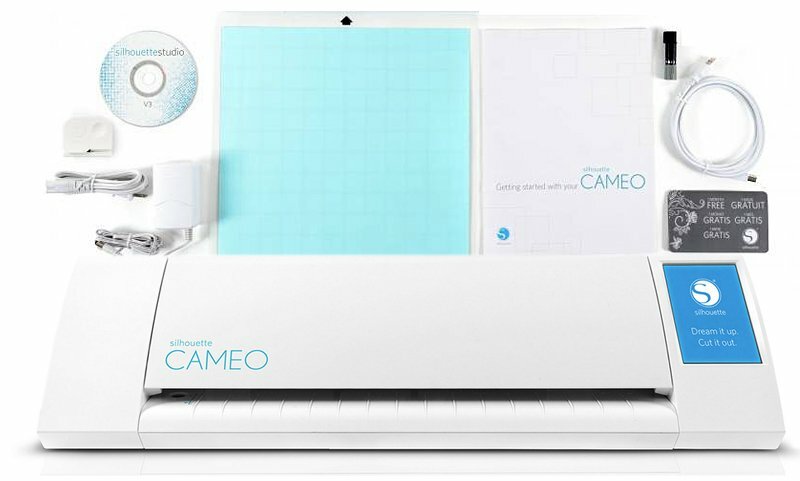 The silhouette cameo is the ultimate DIY machine. Like a home printer, it plugs into your pc or Mac with a simple USB cable. However, instead of printing it uses a small blade to cut paper, cardstock, vinyl, fabric, and other material up to 12 inches wide and 10 feet long. When the blade is replaced by a Pen, the cameo will sketch instead of cut. It can be controlled from a computer or save your art to an USB and plug right into the cameo. The machine also has the ability to Register and cut printed materials and is pixscan compatible. New: comes with: pixscan mat, silhouette cameo studio software for windows XP/ Vista/7/8 and Mac OS x 10.5.8 and higher basic, instruction guide, 51 exclusive cut able designs, vinyl Trimmer blade, black Cutting blade, 12 x 12 Cutting mat, 1 free month to silhouette store, USB and power cable vinyl kit includes:, 4 sheets of 9 x 24 premium vinyl in black, white, dark pink, and Leaf green, 10 feet of premium transfer paper, silhouette hook, silhouette scraper, exclusive download card good for 10 vinyl designs, idea booklet and instruction guide, instructional DVD.